On a mild, breezy Wednesday in early Spring, while residents of Livingston went about their daily routines, a bizarre transaction was taking place on the outskirts of town. Two men met in the parking lot of the local truck stop. According to court documents filed March 26 in Park County, they discussed the sale of a Saiga-12 shotgun, a Russian-made weapon with a magazine that holds 10 rounds of 12-gauge ammunition. In addition to having a shortened barrel, court documents said, the shotgun had been modified from semi-automatic to fully automatic, giving it the capability of discharging a full magazine of 10 shells within a mere 1.9 seconds. The man touting the weapon’s capabilities was a federal agent. After opening his trunk to reveal a case containing the Saiga-12, the agent is said to have accepted a payment of $720, making the transaction complete. Moments later, William Krisstofer Wolf, 52, was arrested without incident. In a federal indictment filed April 17 in Billings, Wolf was charged with illegal possession of a machine gun and of an unregistered firearm, each count punishable by up to 10 years in prison and a $250,000 fine. He has been in custody in Yellowstone County Deten-tion Center since late March, and was arraigned on April 22. At that hearing, Wolf refused to enter a plea, saying he wished to invoke a demand of habeas corpus, and that he did not recognize the jurisdiction of the court. The count entered a Not Guilty plea on his behalf, and he remains held without bond. Wolf, who since 2013 has hosted an internet webcast titled, The Montana Republic, is a self-described “patriot” who purports to be protecting the Constitutional rights of citizens of this state and others. To law enforcement, he is viewed as an anti-government activist bent on anarchy, and a danger to state and federal officers. Livingston Police Chief Dale Johnson said his department received no advance notice of the sting operation. The Federal Bureau of Investigation, after conferring with the Assistant U.S. Attorney prosecuting the case, chose not to respond to questions. Wolf’s court-appointed attorney, Mark S. Werner, also declined comment, as did Park County Sheriff Scott Hamilton. 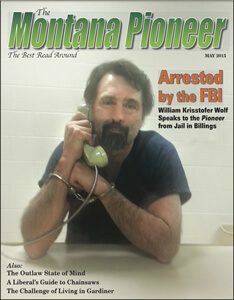 Wolf, however, did agree to speak with the Pioneer in an April 17 interview from the detention center in Billings. “When all of the information is made known to the public, the public will see how this all transpired,” Wolf said, wearing jailhouse blues and cradling a phone above handcuffed wrists as he spoke from the other side of a plexiglass partition. “I wanted to purchase a legal firearm in a private sale. The case against Wolf is built on comments made during his weekly webcasts, as well as conversations he had with both a government informant and an undercover FBI agent in the months leading up to the alleged purchase of the weapon. The criminal complaint asserts that Wolf’s webcasts “advocated the affirmative targeting of law enforcement officers,” and that the purchase of a potent, illegal firearm would assist him in executing his plan. A review of Wolf’s webcasts, as detailed in court documents, would certainly lead the most objective observer to characterize him as far more dangerous than your average community organizer. For example, in June of 2014, the documents said, Wolf stated that, “Until we get the federal government—not the government, (but) the agents and agencies of the federal government—out of our local government, (including) our local police officers, we don’t stand any chance but shooting.” According to the criminal complaint, he then compared shooting law enforcement officers to gopher hunting. By November, court documents said, “Wolf concluded The Montana Republic webcasts by informing his listeners that the time for talking was over,” although the complaint offered no direct quote. The Pioneer independently reviewed several hours of Wolf’s webcasts, seeking to hear the context of the statements detailed in the complaint. Many of his overall comments—on topics ranging from illegal immigration to President Obama’s use of executive orders—are calm, cogent viewpoints so benign that they could easily surface in upcoming presidential debates. On numerous occasions, he referred to his desire for a “peaceful solution,” although he conceded in his interview that such an outcome was unlikely. Wolf makes plenty of statements on his webcasts that certainly can be interpreted as incendiary. In June of 2014, he welcomed guest Gary Hunt to discuss “The Plan for Restoration of Constitutional Government,” which is outlined in 50 pages of detail on Hunt’s website, outpost-of-freedom.com. Referred to on the webcast simply as The Plan, Hunt’s treatise professes to be modeled after one used during the American Revolution to replace British authority. It includes extensive use of “committees” and militias for the establishment of a new governmental structure. In his interview with the Pioneer, Wolf conceded that The Plan did not meet with widespread approval from his webcast listeners, nor from himself. During the June webcast, Hunt said that in taking over county governments and establishing state militias, “committees of safety would play a big role here.” Such committees of safety, which Wolf discussed at various times in his webcasts, apparently drew the attention of the FBI. Every mention of a peaceful solution, however, seems to be spiced with vitriol, as Wolf repeatedly seemed resigned to the idea that a nonviolent “restoration” could not occur. “I want a second American Revolution because I don’t believe that there is any other peaceful solution,” he said in November. “That is why I am trying to bring these shows to you, trying to get you involved. Because you can’t have somebody like me who wants a revolution. You have to be part of this. During his interview with the Pioneer, Wolf spoke with slow, quiet composure, seemingly lacking the bravado that characterized his webcasts. He appeared to be a man steadfastly dedicated to his cause, if not someone unabashed with his dubious, limited limelight, even agreeing at one point to have his photo taken through plexiglass at the detention center. While Wolf’s webcasts drew the attention of federal authorities, his alleged comments to the government informant and undercover agents were far more damning. On Sept. 30, 2014, the complaint said, Wolf again met with the informant and “discussed the Bozeman Police Department’s recent acquisition of a ‘BearCat’ armored vehicle.” Wolf is described as stating “the need to destroy the vehicle and that the most effective method would be ‘cooking it from the inside,’” and “reiterated his plan from several months prior to build a ‘blowtorch gun.’” During the meeting, Wolf allegedly expressed interest in having the informant introduce him to “a former colleague” who could possibly provide technical or monetary assistance in building the gun. On October 10, Wolf met the colleague, who was actually an undercover FBI agent. As reported by the Pioneer, Wolf appeared at a Bozeman City Council meeting on Oct. 6, 2014, to speak in opposition to the Lenco BearCat G3, the aforementioned armored vehicle made available to Bozeman Police through a $253,537 grant from the Department of Homeland Security. According to the Pioneer reporter present at the meeting, Wolf carried a duffle bag to the podium. To demonstrate that the vehicle was unnecessary, he reached into the bag, creating a tense moment, and produced pieces of body armor, saying he could defend himself against such a vehicle. According to the federal complaint, Wolf told the informant by text message on Feb. 9 that he preferred a shortened (sawed-off) military grade barrel on the gun. Documents state that the FBI then made a video recording demonstrating the gun’s capabilities, and the video was presented to Wolf on March 18. He was informed that in addition to a previously agreed sum of $600 for the gun, he would have to pay an additional $125.00 for the fully automatic conversion. Wolf allegedly agreed to the higher price, and the March 25 meeting at the truck stop was arranged. Did he feel he was entrapped? “Yes,” he replied. He remains steadfast in his belief that he is simply a patriot, executing what he considers to be his “duty” as an American.